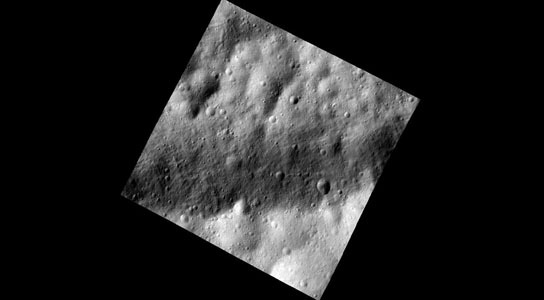 NASA’s Dawn spacecraft has taken its first close-up images of the asteroid Vesta, revealing tons of new detail. Vesta is located in the asteroid belt between Mars and Jupiter. The spacecraft took the opportunity to observe new details about the controversial object that may or may not have been a planet, had it developed differently. There is some debate about whether it is a proto-planet or not. The new photos show small grooves, lines, and dimples along the surface, which may yield clues about the rock’s history. Dawn entered its closest orbit yet on December 12th at an altitude of 130 miles (210 km) above the asteroid’s surface and sent the new images back to Earth on the 13th that NASA just released on Wednesday. The plan is to keep the probe there for about 10 weeks before sending it back up higher to observe with a wider field of view. The hope is that these images will reveal some hints about the composition of Vesta’s surface and its interior structure. The craft will take photos and measurements of gamma-rays and neutrons from the surface. Costing $466 million and having been launched in 2007 to study Vesta and the dwarf planet Ceres, Dawn is already earning its keep. In July 2012, Dawn will leave Vesta and hope to arrive at Ceres by February 2015. 1 Comment on "NASA Probe Takes Close-Up Photos of Giant Vesta Asteroid"
How are those grooves formed? It looks like a walnut.